The Roger Ximenez mock lizard belt is beautiful, with a heavy gauge of leather and intricately-tooled design. The belt is accurately-sized, decreasing the potential that one will purchase the wrong size. While there is a little glint to the design, this belt will make any sort of casual, night-clubbing, or business ensemble pop. 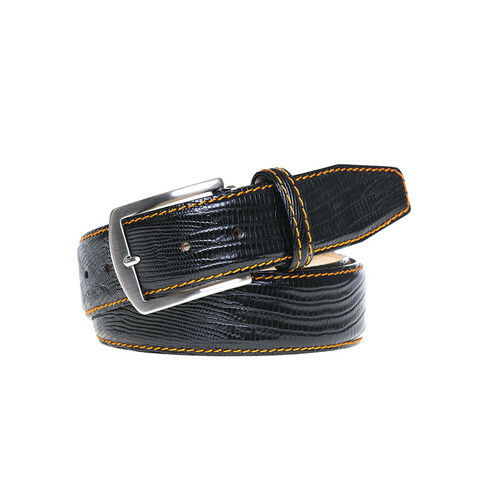 The mock lizard belt comes with gray, orange, red, and yellow stitching and in two distinct widths (35 and 40mm). Each of the belts is hand-made and comes with a travel back to decrease the amount of wear that it will receive in traveling bags. The brass-palladium plated buckle is large without being detracting; it stands out as bold without drawing the eye away from the rest of the outfit. After a few months of daily wear, the belt has not shown the slightest in wear. Where there is a tendency for belts to become shaped or otherwise out-of-shape, this mock lizard belt stays constant no matter how often one utilizes it. The fact that it can be sharp and flashy without being outright ostentatious means that this mock lizard belt is a must have; it works with so many distinct styles of dress, no matter the age or occupation of one choosing to utilize it. The belt retails for $199 and the company offers a $25 coupon for first-time orders. A wide variety of mock croc and lizard belts allow for individuals to cheaply fill out their wardrobe. Roger Ximenez offers other specials on his social media profiles regularly, so make sure to add his Facebook and Twitter for the latest in information about these world-class belts. For those wanting to match their belt and their accessories, Roger Ximenez also offers a considerable array of different iPad sleeves.